For Christmas my awesome fiancee bought me a Kindle Fire. Since then, I’ve been reading books on it left and right. 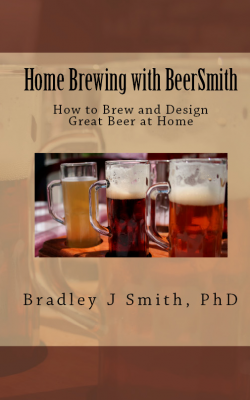 One of the books that I’ve read is Home Brewing with BeerSmith: How to Brew and Design Great Beer at Home by Bradley J Smith, PhD. If you don’t have a Kindle, don’t worry, it’s available in paperback form too. Like the Beersmith Podcast, the book is loaded with lots of homebrew information. It covers everything from brewing the first batch of extract beer to brewing with all grain to designing your own recipes. It covers everything from simple how to, to more complex formulas that are needed for more technical aspects of brewing. There is a lot of good information in this book that a homebrewer could use to make better beer. The knowledge he shares is worth the price of the book. In fact, that’s a really small price to spend if you consider how much you save by not brewing bad batches. However, there were a couple of minor things that distracted me. The book is based on his blog and at times, it reads like a blog. Some things are repeated over and over, there’s a few typos (not that I’m one to talk) and there are times when it feels like I’m reading a sales pitch for the Beersmith homebrewing software. Overall, it’s a good book to have around. There might be a few books that are better for beginners, but it’s probably a better book for intermediate to advanced brewers. This article does contain affiliate links to Amazon and I will get a small percentage of the sale, but I make sure that all of my reviews are fair and honest, not an attempt to get a commission.